oat or barley from the shaft. JosephWright and his second wife, Mary Ann Fryer, came Utah’s Dixie in 1862. He raised cattle and “blooded” horses and was butcher by trade. 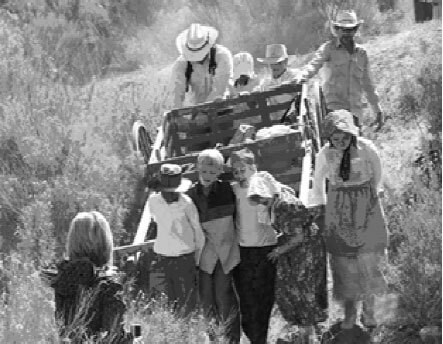 After settling at Duncan’s Retreat, three miles west of Grafton, he sent two of his sons from his first marriage, William and Joseph to California, where they purchased the first horse powered threshing machine in southern Utah. This trip was full of danger and hardships as they hauled it all the way back from California by teams. 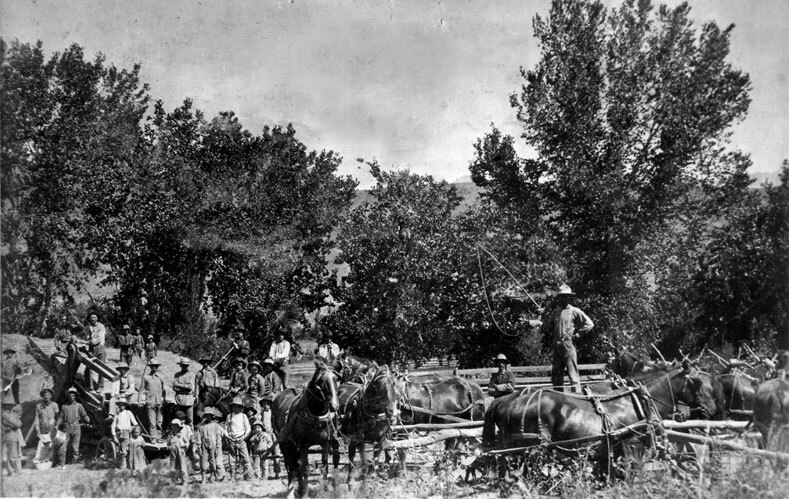 This threshing machine, shown here, was used by all of the farmers along the Virgin River. It took three separate teams to move the heavy equipment from farm to farm. Once assembled it was powered by ten horses endlessly going round and round in a circle. This was truly a community event, requiring upwards of twenty plus men to operate the machine. And when mealtime came the women would prepare food for the entire crew. John Wood, the driver, is shown standing in the center to encourage any lagging horse with his whip. George A. Gibson usually had the job as the tally-box tender because he had lost his leg and had trouble getting around. Other jobs included, band cutters, straw stackers, bundle haulers, field pitchers, grain haulers and scoopers. 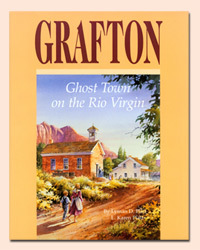 “The book will provide the reader with an insight to the daily lives and activities within the community of Grafton, from its morning to evening habits, to its musically-oriented evening activities and all-night dances, to its religious fervor, to its association with and love of the local Paiutes, to the intrinsic faith and basic goodness of its people. Local folklore is interspersed within these pages, providing a good laugh here and there. The tragedies of death, of floods, of Indian depredations, the hardships of taming the desert environment, all play important roles in the development of the Grafton Saga.” If you are interested in buying the book, mail in the enclosed coupon. The proceeds of the book will go to the Grafton Poject. We will also have books available at the Grafton reunion. 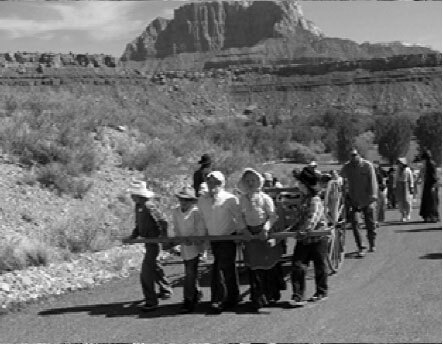 Washington City fourth grade classes doing their annual handcart trek to Grafton. The Rockville Historic Commission received a matching grant from the Utah Division of State History to revise Grafton’s National Register nomination. The Partnership will provide the matching funds to finish the project. The purpose of the state’s grant program is to assist local governments in documenting and preserving historic buildings and archaeological sites. The Partnership completed an application for nomination about 10 years ago. But, the application stalled and it wasn’t nominated. Officials felt having the cemetery and the Wood Road on BLM land included may be the reason why it is being held up in Washington DC. Therefore, the Partnership decided to take out the cemetery and apply later to include the cemetery and Wood Road. Since it has been so long the nomination needed to be revised and the boundary changed. So we hired Bee Lufin an expert on nominations to the National Register to complete the new application. We hired the Arid Land Consultants to fill the voids and cracks in the exterior adobe walls of the Schoolhouse and the Russell Home. They also applied three coat pioneer plaster to the inside of the living room walls of the Russell home. We need to continue to raise funds to plaster more rooms. Please contribute to this worthy cause. Descendants of Grafton will hold their annual Grafton Reunion, September 26th, 2009 at the town site from 12-2:00 PM. Everyone is welcome. Bring your lunch, hat and chair and memories to share. We will have a display of historic Grafton pictures in the schoolhouse. The Partnership will have items to sell to raise funds for the Grafton Project such as books, pictures of Grafton and t-shirts. There will be a program and if you have any stories you would like to tell about Grafton or a song to sing please call Lou Graff at 702-649-7155 so he can put you on the program. Grafton returns us to a time when life was tenuous, but strengthened by residents who relied on religious faith and each other to survive. Such communities, then and now, instill a sense of belonging to place. This connection between people and landscape lives today through many of Grafton’s descendants. May you be enriched by Grafton’s history and join us in preserving its future. Donations are gratefully received and tax deductible. You can donate with a credit card on our secure web page www.graftonheritage.org , Click on support us.